Wednesday, July 3 – 24 hours of sun is beginning to play with my internal clock. Slept until noon and don’t think that’s happened since college. Played a couple of games of Farcle with my housemates. A game with 10 dice – all made from walrus ivory with amber inlays. Julius and Willard both announced over the walkie-talkies that they are taking crews to scout for belugas. Went outside and surprisingly quiet. Dogs mellow, no kids, no ATVs. A bit cooler, light wind, and few mosquitos. Walked up the road to Marjorie’s without bug netting. Midday reports of belugas at Omalik Lagoon about 50 miles away. Went to Willard’s church (which doubles as a library and daycare) to look for the Pequots and found Ashanti playing with lots of kids. At about 5, just before dinner, we heard that the hunt had been suspended because of rain and rough seas. Had dinner, then walked with Robert and Andy to the Emergency Response Center in town to look at maps of the region and get our bearings. On our way back we stopped at Willard and Joanne’s house to visit and Willard gave us some updates and indicated that they were going back out in the morning about 9 or 10am and would probably miss the July 4th celebration in the village. We returned to find Rhoda and her one-year-old daughter, Dolores, Brian, Sammy, Glen, Joseph, and another girl visiting and eating Eskimo donuts that had just been made. Played more Farcle and Bananagrams. Started to watch “Girl with the Dragon Tattoo” at midnight with the biologists and got a report that Jim Jim had spotted the belugas about 20 miles from Point Lay and that Willard and others were heading out shortly to begin the drive. Suspended the movie and headed to bed in anticipation of an early morning rise and a flurry of activity. 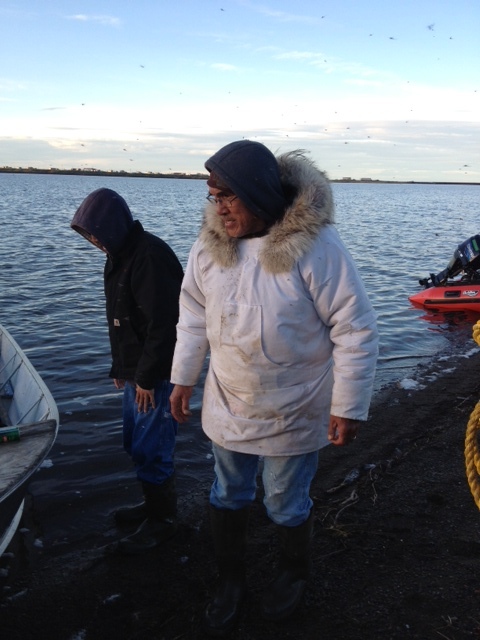 Thursday, July 4 – Robert woke us all (Leslie, Tracy, Andy, Hans, Ashanti, and Rafaela (a forensic veterinarian who flew in from Barrow once the belugas were initially spotted)) up shortly after 3:30am with news that the whalemen were in the lagoon and the hunt had commenced. I heard Willard over the radio say a prayer ‘thanking the Lord for the bounty they are about to receive.’ I got ready, put on hip waders (as I would find out later, these were a necessity) and ran up to Marjorie’s to wake the girls. On the way and for the next half hour or more I heard numerous gunshots. Temperature in the 50s and an insane number of mosquitos! 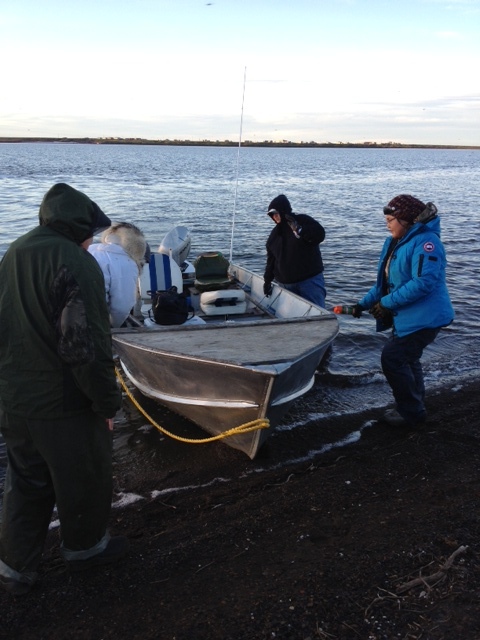 We gathered our gear and rushed to the zodiacs at the boat launch, making our way across the lagoon to the beach where Willard indicated they would bring the beluga (sisauq is the Eskimo word). The first beluga was towed to shore at 4:30. Over the course of the next hour a total of 26 beluga were on shore. Most were lashed to the sides of their small (15-18 foot) aluminum outboard motor boats. Sometimes one, sometimes two. 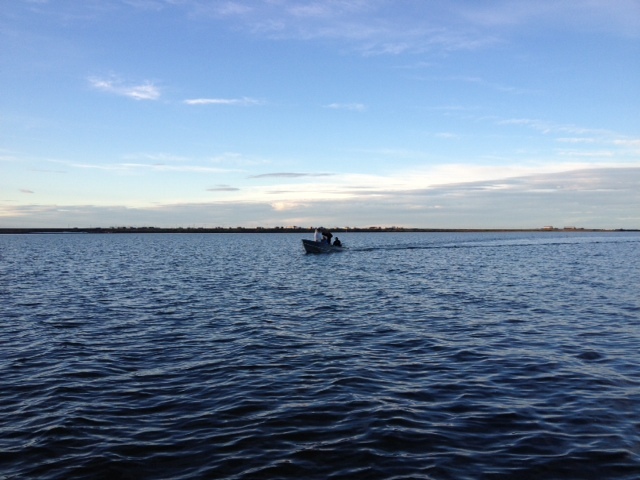 Several individual belugas were towed behind the boats and one group towed four at one time. One of the boat captains was intent on recovering an antler harpoon he made and I learned at that time that many belugas had been harpooned first with line and floats so they would not be lost. Then they were chased down and shot. The hunt is sometimes very unpredictable and last year a disappointing 14 belugas were harvested – in the past over 100 have been taken; 30-40 was the goal this year. 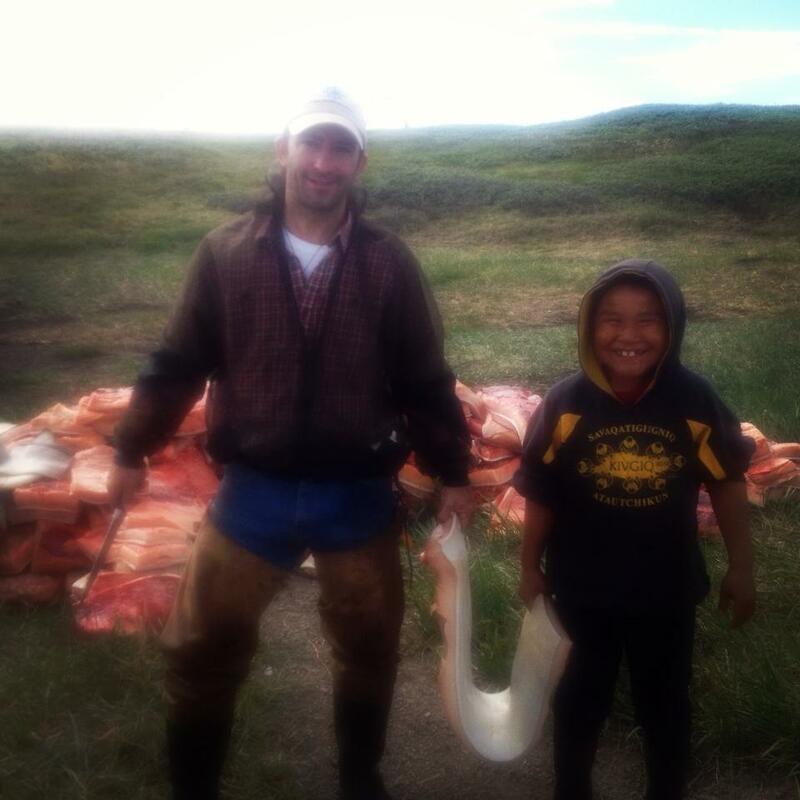 Each time a boat came in we congratulated the hunters and were greeted with lots of smiles and a “HAPPY 4th of JULY!” All hands available used the ropes tied to the beluga flukes to haul them up on shore for processing. 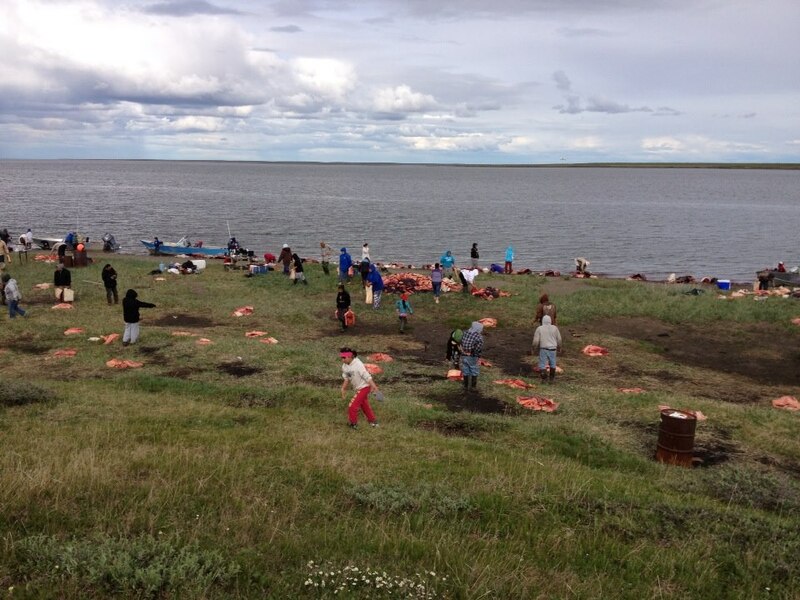 Once all of the belugas were ashore, the hunters returned home to rest for the community gathering later in the day. 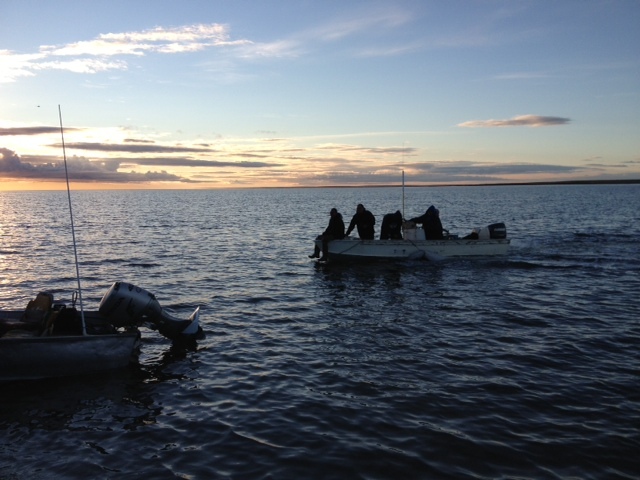 From 4:45am until 1:30pm, I helped the biologists with their work collecting data on the beluga population. This is something Robert has initiated in the early 1990s and it is because of his excellent working relationship with the community at Point Lay that this is possible. A total of 17 female and 9 male belugas were killed and blood, DNA, and other non-invasive samples were taken from all of them. More intensive sampling was conducted on about 16 individuals involving large tissue samples (I’m not going to get technical, but basically blocks of skin and blubber, muscle, heart, kidney, liver, eye, brain, jaw, and fetus (two were full term, one was mid-development, and several other were embryotic)). This wasn’t a “smash and grab” operation. Rather, it involved carefully preparing the muktak (skin and blubber) and meat and laying it out on the beach grass and along the way collecting the needed biological data. This allowed the biologists to get what they needed and to offset the disruption to the community by reducing their amount of labor (something they do appreciate since it can sometimes take days to process a large number of beluga or just one bowhead whale). Robert and Hans did all of the knife work, others collected samples, and Andy and I moved most of the muktak and meat. During our processing, the walkie-talkies were abuzz with “good morning, good morning – Happy 4th of July.” The Pequots returned to the village for a rest earlier in the morning and plans were laid out for a community 4th parade and awards for best float/ATV. Willard also announced that the community would be arriving at the site by about 2pm. I had planned to stay and assist the biologists, but wanted to be somewhat lucid when the community came, so I took an hour-long nap in one of the tents. When I did get up around 2:30, Point Lay folks were just beginning to arrive and set up. I saw Joanne, Willard’s wife, and asked how I could help. Almost immediately I was given a knife by community elder Alan Upicksoun and put to work. I got tips from Alan, Joanne and Willard, Nathan Henry Sr., and many others but picked up the process quickly. Essentially a long slice along the spine through 3 inches of skin and blubber then a series perpendicular cuts from the spine to the underside, each about 12-16 inches wide. “Handles” were cut near one end and sometimes both – a 3-4 inch slit, diagonal or L-shaped, through the skin and blubber to grab and hold while cutting in and for holding and walking it to the pile of food. 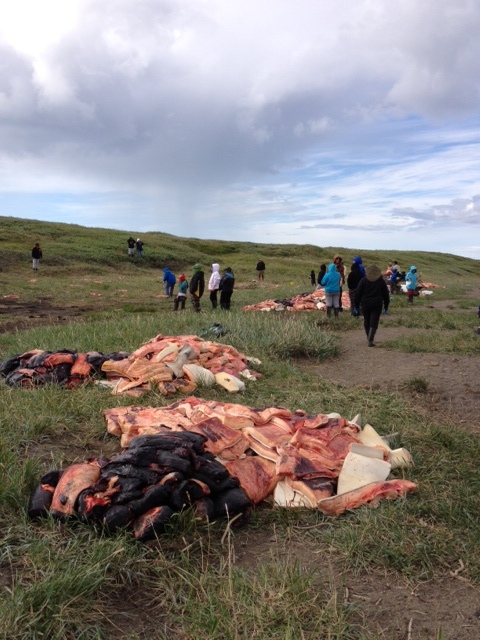 We also cut out the backstrap meat of the belugas – about four feet long (and still very warm after 12 -16 hours! ), cut in two or three pieces, and probably about 30-40 pounds of meat on each side. 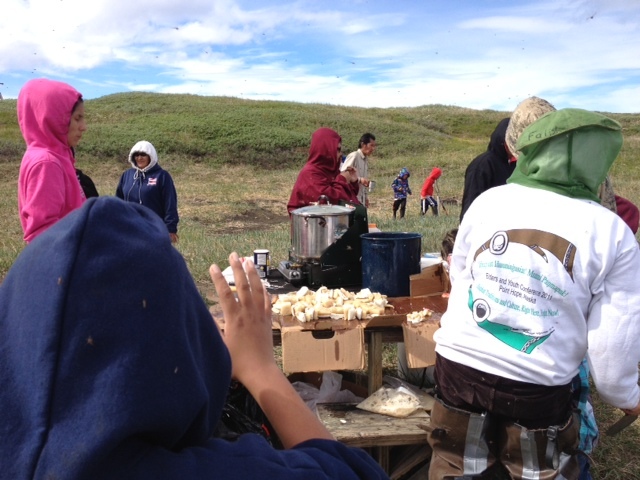 The Inupiaq/Eskimo kids who had learned my name quickly when I arrived in the village (to their surprise, I had also learned their names quickly) became my helpers – George Stalker, Nathan Heny Jr., Sammy Henry, Raelyn, and Elmo. They would take the muktak and meat, fins, and tails, wash them in the lagoon, and carry it to he pile, and come back for more. Every once in a while one of the kids would ask me to cut a beluga part for them – a fin, or a liver, etc. They were all having such a great time “playing with their food.” Incidentally, blood and oil from the belugas is an amazing mosquito repellant and every time I finished a cut, I slathered myself in it. I took the Zodiac back to the village to get Crissy (the Pequot kids chose to stay home) around 3:30 or 4:00. One of the elders, Nora, and a group of woman prepared some boiled muktak chunks (2×2 inch) and we were all invited to take a break and share in the bounty. Willard suggested salt and mustard – such a treat on many levels. During the afternoon, Robert Lisbourne stopped and showed me a brass toggle harpoon his father Julius had made. He had just recovered it from one of the whales. Over the course of the day, several massive piles of muktak, meat, fins, and tails had accumulated. By 6pm, most of the cutting was completed and Willard called everyone to attention. He explained that the “shares” would be evenly divided among the 53 households at Point Lay. He directed everyone to bring two pieces to their pile. Once done, he instructed everyone to take another two pieces, and so on until all distributed. There were five “viewers” on the hill to ensure fairness. Jason and George, muktak in hand! Boiled muktak! A treat after the harvest. Distribution time to 53 households at Point Lay. This entry was posted in Uncategorized and tagged Alaska, beluga whale, Inupiaq, Jason Mancini, Mashantucket Pequot, Pequot, Pequot Museum, Point Lay, Research Travels, whaling. Bookmark the permalink.